Need help? Just click on the treatment you are in need of below for more information. Regular dental examination are important not just to detect tooth decay but to monitor the condition of the whole mouth. The soft tissues of the mouth and tongue should be regularly examined in order to screen for oral cancer and many other medical conditions which present symptoms in the mouth before they can be noticed elsewhere in the body. The gums too need to be regularly checked as gum disease if often painless and can often be quite advanced before any symptoms occur. It is practice policy to provide comprehensive dental examinations for all patients. 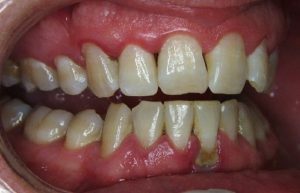 Can you do a white filling?, is a question often asked by patients. Tooth coloured fillings are placed routinely in front teeth and modern materials maintain colour and polish much longer than some of the older fillings did. Replacement of stained and discoloured front fillings is simple and within reason long lasting. Back teeth can also have white filling placed providing the cavity is not too large. With larger cavities we would recommend tooth coloured inlays or crowns in order to ensure long lasting results. This practice provides a comprehensive range of cosmetic dental services. Such as tooth whitening, white fillings, crowns, veneers and smile makeovers. If you would like to know more about the cosmetic treatments available then please do not hesitate to ask the dentist, nurse or receptionist they can discuss these treatments with you in more detail. If a tooth is heavily filled, badly broken or has given severe toothache then the nerve often dies and must be removed. If nothing is put in its place inside the tooth then recurrent infections, abscesses, cysts and discomfort will result. For this reason if the nerve has been removed or has died then the root canal of the tooth must be cleaned, specially shaped and then filled usually with a rubber like substance called gutta percha. In the vast majority of cases the tooth will then remain healthy and symptom less . The filled root canal can often be used for extra retention using posts for crowns and bridges. Orthodontics is the term used for tooth straightening. This can be done with either removable or fixed appliances and usually takes 18 months to 2 years to complete. This practice undertakes orthodontics on a NHS and private basis. Orthodontic treatment can be provided to both adults and children. We offer conventional metal fixed braces, private cosmetic white braces and invisible braces. We offer orthodontics on a Private and NHS basis to both children and adult patients. For adults there are a range of cosmetic options including white brackets for fixed braces and removable invisible braces such as Smilelign. 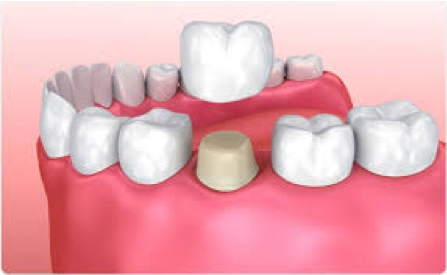 A crown (cap) is an artificial shell that fits over the existing tooth or root and resembles the tooth that it is replacing. Crowns can be made from porcelain, gold or porcelain bonded to gold and combine strength, function and appearance to previously damaged or broken down teeth. At the back of the mouth where aesthetics are not so important simple gold crowns are often the treatment of choice. These restorations require minimal reduction of tooth structure thereby preserving as much of the natural tooth as possible. At the front of the mouth porcelain crowns are often provided as these are extremely lifelike in appearance. The biggest drawback with porcelain is that it is not as strong as metal used in crowns. However, some modern porcelains such as ‘Procera’ and ‘Empress’ are cast like metal and are so strong that they can in some instances used to restore back teeth. Porcelain bonded to gold is also used extensively as it combines the strength of metal with the appearance of porcelain. Veneers and inlays are made of porcelain or composite ( a plastic material) and with modern adhesive techniques they can be stuck onto the surface (veneer) or into (inlay) a tooth to give a strong, long lasting and very lifelike restoration. 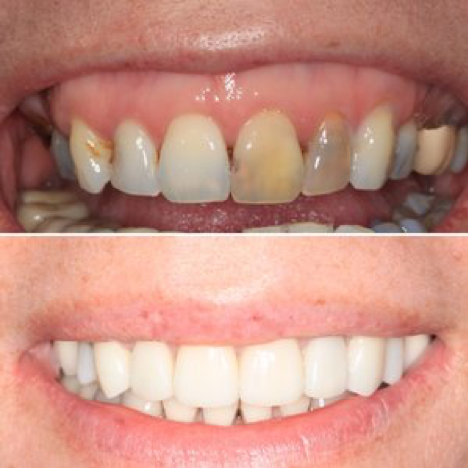 They are used to mask discoloured teeth or to restore teeth that have broken or have large cavities in them. 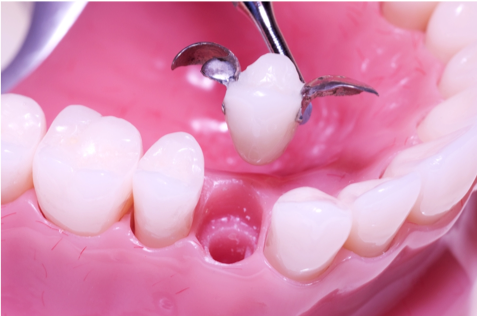 With this technique a false tooth can be cemented onto the adjacent teeth using small metal ‘wings’. The advantage of this technique is that it involves very little destruction of healthy tooth tissue and usually does not need local anaesthetic to prepare it. The disadvantage of this option is that the teeth next to the space must be relatively intact and also it does not have the strength of a conventional bridge. There are however many situations where a Maryland bridge is the treatment of choice. Porcelain ‘lattice’ bridges are now also available where the metal ‘wings’ have been replaced by porcelain making them more aesthetically pleasing. Where tooth loss is quite extensive dentures are often the only way of providing replacement teeth. 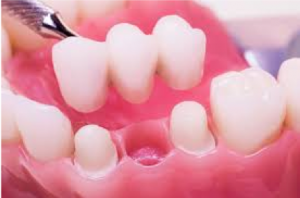 For full dentures this practice always uses the highest quality acrylic and the utmost care and attention in design and construction to ensure attractive, long lasting and well functioning teeth. 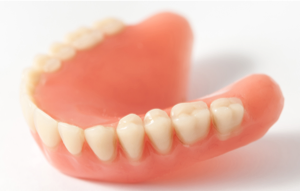 Partial dentures are provided where some natural teeth are still present in the mouth. 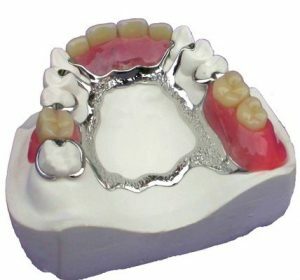 The best type of partial denture is a chrome denture. This type of denture has a metal framework that attaches the denture to the remaining teeth and provides a strong and comfortable denture. A chrome based denture is much better for the survival of the remaining teeth than an all plastic partial denture. 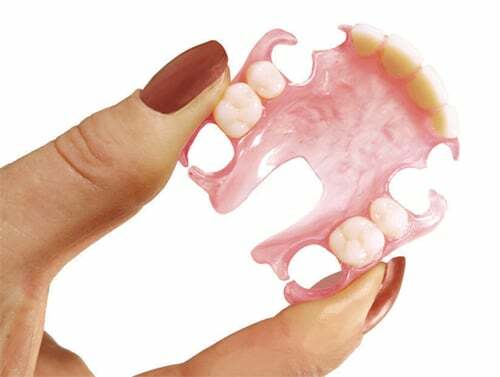 Chrome dentures are more expensive than acrylic dentures but as they last longer and preserve the natural teeth they are usually the better choice for value for money. After teeth have been extracted the gum takes up to 6 months to heal completely. Though dentures are often provided immediately after extractions as a temporary measure the new permanent denture should be made 6 months after the extractions. Probably the most common use of implants is to support full dentures that are otherwise very loose. Another common usage is to replace a single tooth that is surrounded by other healthy teeth. Implants are also used as an alternative to dentures. Implants can help solve the many problems associated with the wearing of dentures and can be used to replace single or multiple missing teeth. An implant is a small titanium post which is placed directly into the jaw bone, it is then left to bond with your own bone substance. Following a period of approximately 3 - 6 months the implant has bonded with the bone to provide a strong permanent root similar to the root of a natural tooth. This will ultimately support the restoration i.e. : crown or bridge. Implants can only be placed where there is sufficient bone present to hold the implant. However all is not lost if bone is not present and a technique called Bone Augmentation can be used to build up the bone either at the same time as placement of the implant or prior to implant surgery. Implants are more costly than most dental procedures, however staged payments throughout the course of treatment can be arranged to make this more manageable. Bone loss caused by missing teeth may mean that the placing of implants is not possible. If the bone loss is not too great then the technique of bone augmentation can be used to encourage the re-generation of new bone growth and will build up the deficit of bone in that particular area either at the same time as placement of the implant or prior to implant surgery. 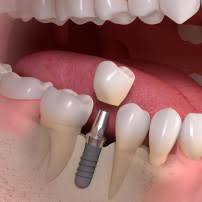 If you are interested in Dental Implants as an alternative to dentures to replace missing teeth then pleased speak to the dentist who will be happy to explain the procedure to you. Almost everyone suffers from gum disease at some time in their life. This is often minor and you may only be aware of it because your gums bleed when are brushed. However even small amounts of bleeding can indicate that disease is present and permanent damage to your gums can result. A proportion of the population (about 15%) are especially susceptible to gum disease. Gum disease can start in the teenage years or earlier and progress throughout life. As it is a chronic (long term) infection, symptoms such as pain are usually absent, though bleeding whilst brushing is usually present. If the problem is allowed to continue unchecked the gum and bone supporting the teeth will be lost and will cause teeth to become loose leading ultimately to their loss. There is some evidence that untreated gum disease may increase the risk of coronary heart disease.Gum disease cannot be cured but its progression can be halted if it is detected early and treated. This practice has screening built into every examination to ensure that any problems can be detected early and the appropriate action taken. Tooth whitening is a treatment used to lighten natural teeth. It will not change the colour of crowns, bridges or dentures, white or metal fillings or veneers. Whitening your smile is one of the least expensive and easiest ways to enhance your appearance and with the guidance of the dentist is relatively simple to carry out. It be done done at home or in the surgery. It is important to protect the teeth when participating in any form of contact sports. 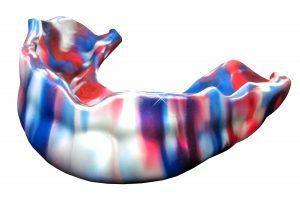 At Queen Anne’s Dental Practice our dentists can make a mouth guard specifically made to the individuals teeth. This type of gum shield is the best option available. Over the counter gum shields which are a one fit for all do not offer the best protection and often increases the chances of jaw and skull fracture. They can also be constructed to fit over orthodontic braces and are available in multiple styles and colours.